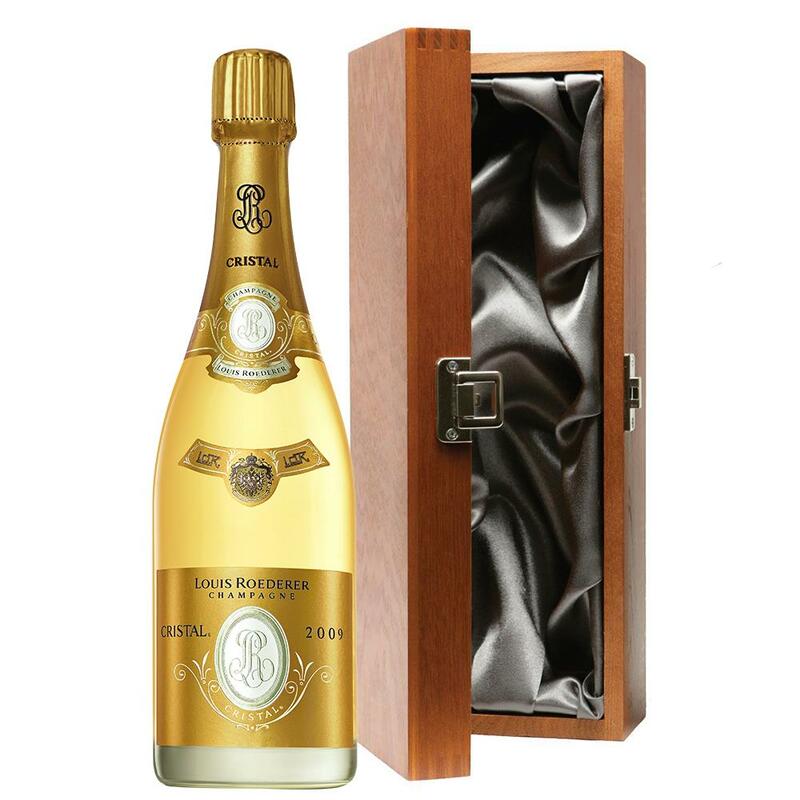 Luxury added to your bottle of Louis Roederer Cristal Cuvee Prestige 2008 with the alluring wooden case with hinged lid. The case is made from wood, which is beautifully complemented with stainless steel hinges and clasp. This case adds the ultimate luxury to any gift and is delicately lined with silver satin. Louis Roederer Cristal Cuvee Prestige 2009 Champagne Bottle - Louis Roederer Cristal Gift Box LOUIS ROEDERER CRISTAL CUVEE PRESTIGE 2009 The jewel of the House is Cristal created in 1876 for Tsar Alexander II. This champagne at its finest as inspired today as it always has been the embodimient of elegance and purity. 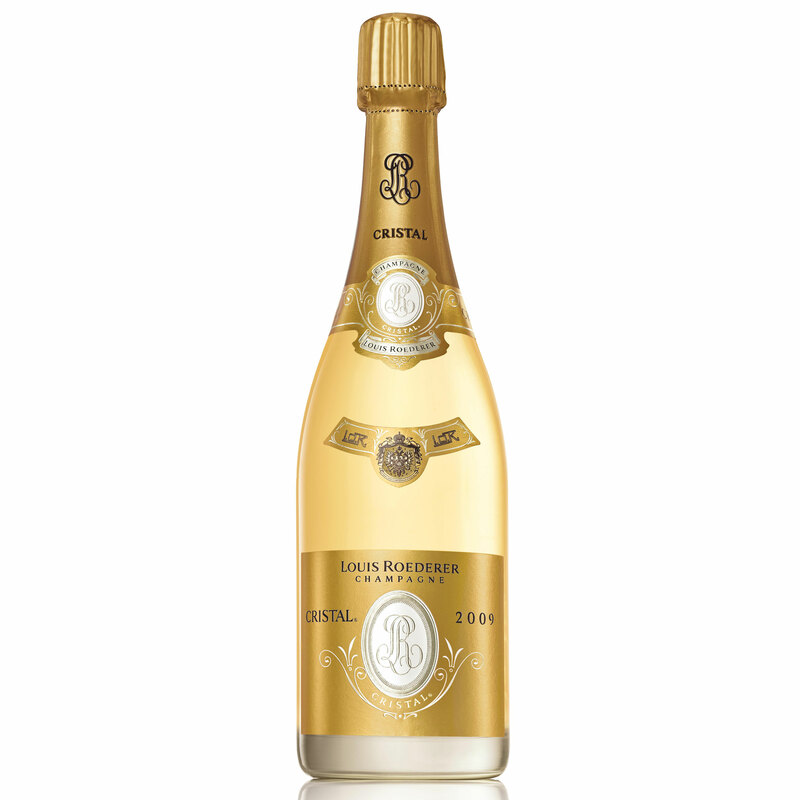 Cristal is made accordance to the strictest criteria based on a drastic process of selection applying to the vintage the cru the village the grapes and finally the wines. Only Pinot Noir and Chardonnay grapes from the House's 10 most celebrated crus are used in the production of this legendary cuvee. Blended from 55 Pinot Noir and 45 Chardonnay grapes and aged for an average of 5 years plus 6 months after disgorging it is yellow green in colour with fleeting glints of gold. It is rich and intensely fruity on the nose with a rounded palate of citrus against a background of red berries followed by a subtle toastiness and notes of almonds. A combination of both freshness and delicacy alongside creamy bubbles it has a finish of exquisite length and crispness. The color of the 2009 vintage is burnished yellow with gold reflections. On the nose the wine opens with the youthful intensity of white flowers citrus and red berries followed by warmer notes of toast chocolate and wood. The palate shows a mixture of ripe lush fruits (vine peaches) and toasty aromas with a dense and fleshy structure. The silky texture on the mid-palate culminates in a glorious finish. Sending a bottle Louis Roederer Champagne makes any gift VERY special. Send more Louis Roederer gifts please see full list below.